A real 90 degree dog leg from left to right, with a huge chestnut tree standing at the point where the hole changes direction. The view from the fairway is a beautiful one, with tall, scotch pine trees surrounding the green on all sides. A bunker 40 yards short and 2 guarding the front of the green provide the difficulty for the approach shot. A treacherous slope from left to right makes putting tricky. A true dogleg! A fade off the tee is ideal to make the approach shorter. 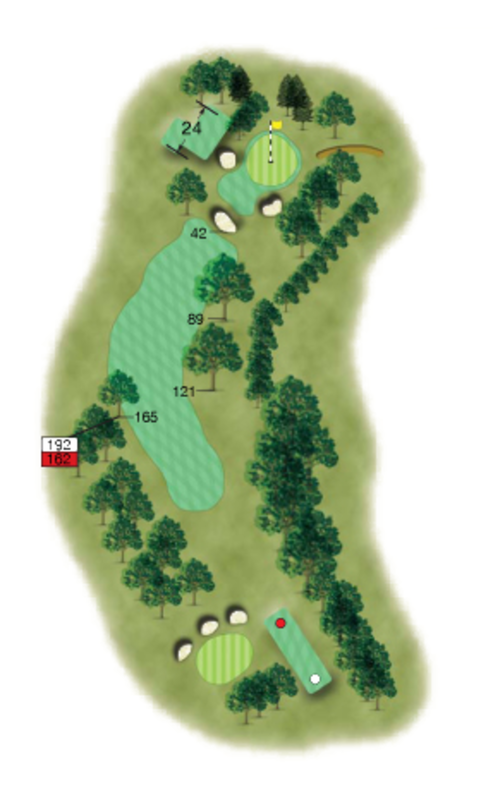 The green is very tricky with hidden slopes and deep bunkers guarding the front.